For years, access has been denied to the infamous and notorious Robber’ Cave. Now, Lincoln, Nebraska’s, only underground attraction is no longer shrouded in mystery. 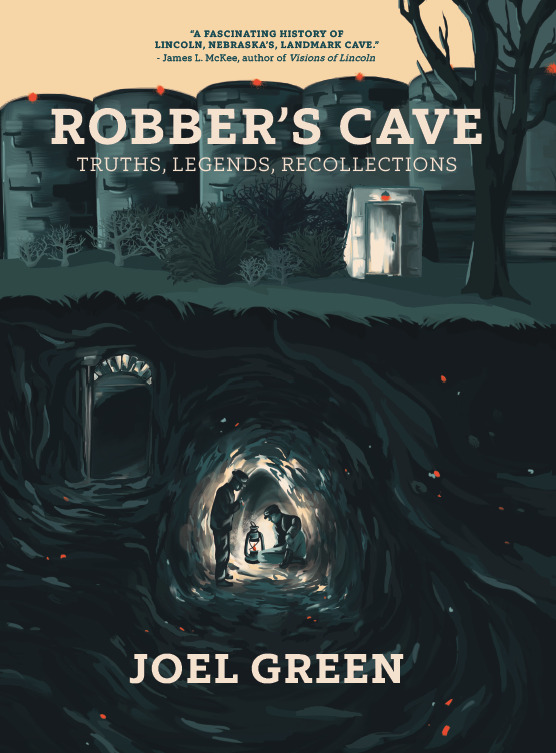 Whether you visited Robber’s Cave legally or illegally, are learning about it for the first time, or are one of the thousands who have returned to the sandstone tunnels for a trip down memory lane, you will enjoy discovering all aspects of the cave’s fascinating past in ROBBER’S CAVE: Truths, Legends, Recollections by Joel Green. Green, a local teacher and tour guide, tracks the cave’s ownership through the past century and beyond, which has included colorful characters to say the least. From the legends of use by Central Plains Indians, Jesse James, and the Underground Railroad, to factual uses by Lincoln’s first brewery, Coxey’s Army, and the Ku Klux Klan, Green not only examines the geological and man-made origins of the cave, but he includes entertaining anecdotes he has collected from guests as well. Robber’s Cave is older than the city of Lincoln, and its tunnels are no longer sealed from the public. Enjoy Green’s extended tour of what he has always felt is a story that deserves to be told.